Back when I gushed over reviewed Schell's Chimney Sweep with Cocoa Nibs I noted that it was one of two biers exclusive to the brewery's autumn Prost Pack. You see the other above. The keller (unfiltered) pils is apparently popular amongst Minnesota brewers as Shell's neighbors to the northeast, Summit, brewed one earlier this year. So it's not the most glamorous variation in the German craft beer pantheon. I highly suspect that it doesn't taste like grapefruit, although I sometimes wonder how long it is before Schell introduces a Huell Melon IPL, and I doubt that exotic ingredients were sourced from all corners of Christendom. But unfiltered lagers have a special place in my heart as I quaffed a few back in the dorm in 1990 and they helped give me a taste for good bier. Keller Pils poured a fairly bright yellow and was quite hazy. Considering past pouring that produces the most minimal of heads, I lucked out here and managed to produce a big white one. The foam was comprised of small bubbles, was quite firm, and lasted a goodly length of time. Simply lovely. Just like a good pilsner should, there was a surfeit of bubbles in the bier. It was a beauty, eh. The Prost Pack came out in early autumn, methinks, and I drank my Keller Pils in November. Ergo this wasn't as fresh as can be but I didn't feel a couple months of sitting around in a cooler would do very much harm. Taking a whiff I found myself vindicated as the aroma was still sharp and pungent. The fresh bread scent was heavenly and was adorned by sprightly hops that added grass and a touch of citrus. I've read the words of drinkers who prefer ales quip that they do so because of their complexity. Lagers are clean, they say. Fair enough. I don't think having a preference for ales is a great character flaw. But I do feel that to dismiss lagers as being like a solid black painting by Frank Stella while ales are equivalent to a colorful Jackson Pollock melange is wrong. While lagering does away with a host of flavors from the yeast, to assert that lagers lack a breadth of flavors is an ill-considered piety. I grant you that there are lagers out there that would do well with a brewmaster who used caramel malt more judiciously, but to cast lagers aside as the simpletons of the beer world is patently unfair. Hopefully the day will come when describing a lager as "clean" ceases to be a shorthand for uninteresting or lacking in complexity and, well, "That's all folks!" 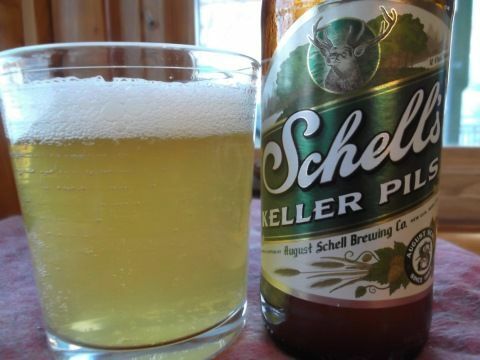 Keller Pils may not be the pluperfect example of the wonderful and varied gustatory tapestry that can be woven with grains, but it certainly has a complex, if subtle, taste. The malts offer flavors of biscuit, cracker, and bread. The differences are, as I said, subtle. For me they are a range of roasted flavors. Cracker tastes more roasty on one end with bread being more doughy at the opposite with biscuit in between. Being unfiltered, there was also the taste of yeast. The hops were big and bright, though not especially bitter, with a fresh grassy taste that had a crisp sheen of citrus. At the finish the grainy medley yielded to the hops which took a turn towards the herbal while also being slightly spicy. The bitterness and dryness were firm though not overpowering. Schaumhaftvermoegen was everywhere with a thick foamy web lining my glass. Ausgezeichnet! Perhaps not in the first flush of youth but my Keller Pils didn't seem to have lost much over the course of a couple months. I loved the delicate malt flavors along with the assertive, yet not deadly, hops that had all the Noble Euro flavors. Crisp, sprightly, and, yes, clean. But not boring! Junk food pairing: For German pilsners, I usually prefer Kartoffelchips. Plain work well as they don't blot out the flavor of the bier. But less intrusive flavors such as cheese also pair well.